Dining in the south west corner of France is a pleasure - excellent food at good prices. Below you will find a selection of our favourite restaurants. In the Vicassiau family for three generations, the Belle Auberge ranges from the four course menu du jour at €13 to a la carte. Booking is advised. In the summer you can eat under the trees in their lovely shady gardens. The proprietor Freddo, aided in the kitchen by among others his father Pierrot, and in the restaurant by Alise, Martine and Bernadette, will offer you a great dining experience. Susie and Jean-Luc Vicassiau are on hand to welcome you to their charming auberge next to the church in Laas. Jean-Luc, brother of Freddo in the Belle Auberge, offers a four course menu du jour at €13 to a la carte. In the summer you can eat on the terrace and in the colder months, the cozy dining room is warmed by the wood burning stove. Local artists exhibit in the dining room, with works of art for sale. The Hotel de la Paix offers first class dining in a large comfortable dining room, with outside dining in the garden during the summer months (May to October). It is essential to reserve a table on Saturday evenings and for Sunday lunch. For larger groups, there is a private function room in the garden which we have successfully used in the past. This takes groups of up to 60, and you can stay all day and all night. 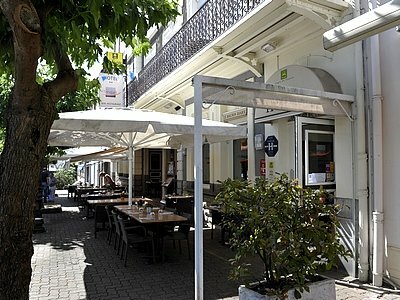 Hotel du Trinquet offers excellent food, good daily specials set in a more contemporary dining area. The bar area also offers tapas meals and snacks. There are many other restaurants to choose from. 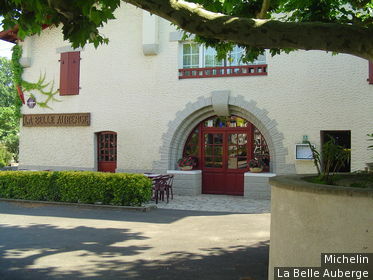 At Auteville (2.5km) there is the Auberge de Blondain. After a traditional lunch you can enjoy a glorious walk back to Le Pehau with stunning views of the Pyrenees. What better way to justify a relaxing afternoon by the pool? 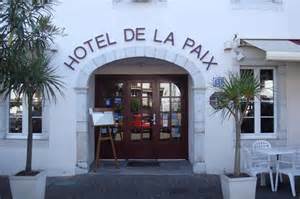 In the market square of St Palais (11km), in addition to the Hotel de la Paix and Le Trinquet there are two further restaurant / hotels. The Hotel du Midi offers good local cuisine at excellent prices. 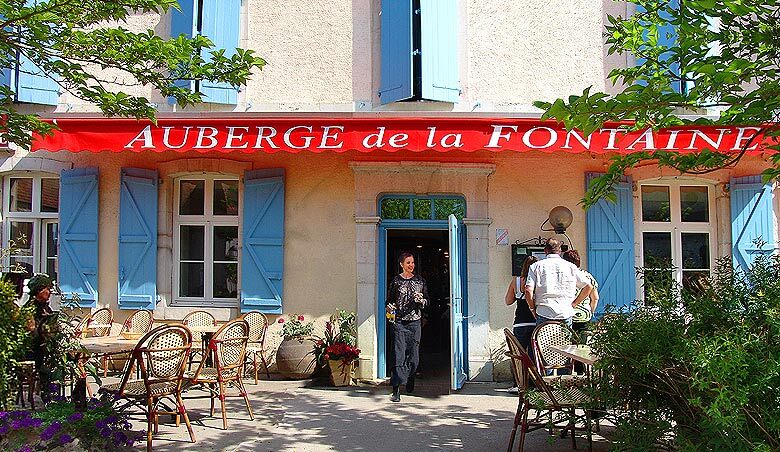 The Auberge du Forail offers wonderful value and a warm welcome. It is an excellent location for both lunch, when you will witness the local French Artisan enjoying his lunch time ‘repas’ between 12.30 and 2.00, and for an evening meal. Also in St Palais is the Bar Xavier where you will find a good selection of traditional plats, pizzas and salads. At Audaux (11km) the Auberge du Claverie offers a selection of menus, ranging from €13 to €29 (limited à la carte) with wonderful regional produce, beautifully prepared and presented in a lovely dining room. Again, booking is recommended. Hotel Les Pyrénées (Michelin 1 star – ‘a very good restaurant’) at St Jean Pied de Port (40km) www.hotel-les-pyrenees.com has been very popular with Le Pehau clients. Menus start at €45. Biarritz – plenty of choice ranging from fine dining to pizza and croque monsieur cafés. Le Pehau offer a table d'hôte service (not weekends). We will cook, serve and clear away regional specialities in your gîte. 24 hours notice is required, menus offered a maximum of three times per week, all dietary requirements catered for. The above menu would be €15 per adult and €10 per child under 12 (childrens menu also available), wine included.